The monitor lizard was later released back into its natural habitat. A two-foot-long monitor lizard was found in the premises of Delhi Secretariat causing a stir at the hub of the city government, a wildlife NGO today said. The reptile, a non-venomous species, was found trapped inside a turnstile (automated gate) in the lobby area and was later rescued, Wildlife SOS said. But, the sprawling campus of the Secretariat is no stranger to such unusual visitors. "Last year, we rescued a 3.5-ft-long cobra from the Secretariat," said a member of the team, which rescued the lizard on Thursday. 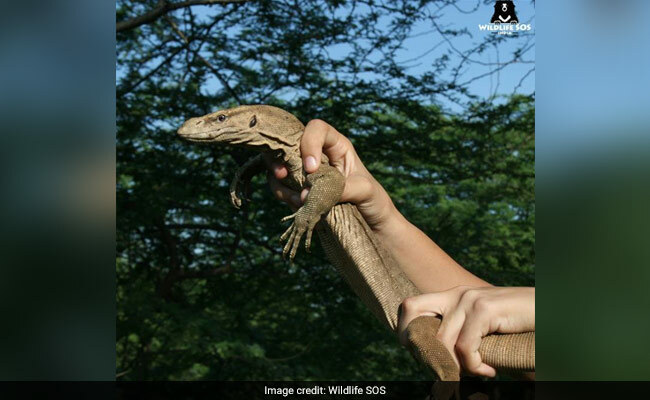 Kartick Satyanarayan, co-founder, Wildlife SOS, said "Monitor lizards are non-venomous and pose no threat to humans. As a result of continuous deforestation and expansion of human habitation these largely misunderstood reptiles are often forced to wander out of their natural habitats in search of food and shelter." "They play an important role in the ecosystem but they are often killed for their meat and body parts due to misconstrued beliefs," he said. The NGO said that after being kept under observation for a few hours the lizard was released back into its natural habitat.